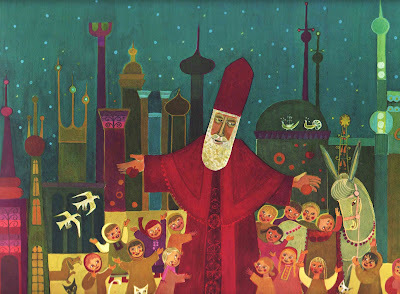 This lavishly illustrated story about Saint Nicholas (the patron saint of pawnbrokers and the model for our modern day Santa Claus) is really gorgeous to look at. 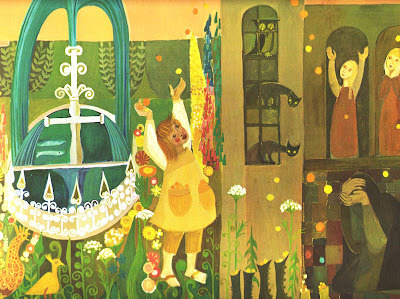 The deep, muted colors and geometric designs are wonderful, even if the story is long and a bit dark at times. 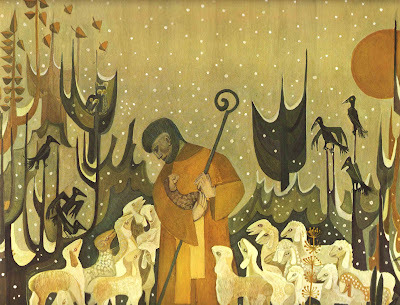 Every year, on December 6, St. Nicholas travels through the towns and villages with his servant and his little donkey. He brings the children presents, and if they have been naughty, he scolds them. Usually he wears a richly colored robe, with a tall miter on his head and a golden crook in his hand. Do you now why he is dressed like this, and why his feast is celebrated each year? Well, try the fact that this kid is totally loaded with treasure and gold, but he is grief stricken and lonely because he parents died and left him an orphan. The pitiful child soon finds the only thing that makes him happy is turning to God and giving away all his riches to the poor. He eventually grows up and God makes him a bishop for his good deeds and as legend has it... Bishop Nicholas died on December 6 in the year 352. The children remember this day as St. Nicholas Day, and they say that every year good St. Nicholas and his little donkey bring them presents. 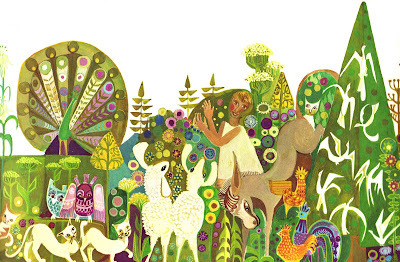 I'd love to know more about this illustrator, but sadly most everything about her (her?) online is in another language (um... ah... German?) Anyone? Anyone? Thanks! 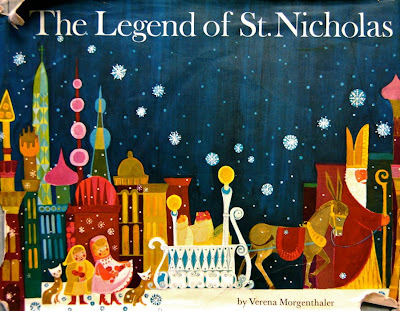 I was just wishing I had a good St. Nicholas book! This is beautiful! I'm going to look for this one.